I’ve had quite a few people asking me about this piece, so have decided to give some insight into its conception. The full name, which has had to be abbreviated for the sake of practicality, is “Vision of the compound eye“. The Colony collection has very obvious ties to the fascinating world of bees and where most other pieces are recognizable alongside each other, this piece stands slightly to one side. It IS connected though, perhaps not visually an obvious connection, you’ll see that it is a relevant connection. Bees have the compound eye that some may have seen detailed in the wonderful macro photography now possible (if you haven’t, see the below image of a bumble bee peeper). If a single bee is eyeing you up, you will have a couple hundred eyes starting at you! 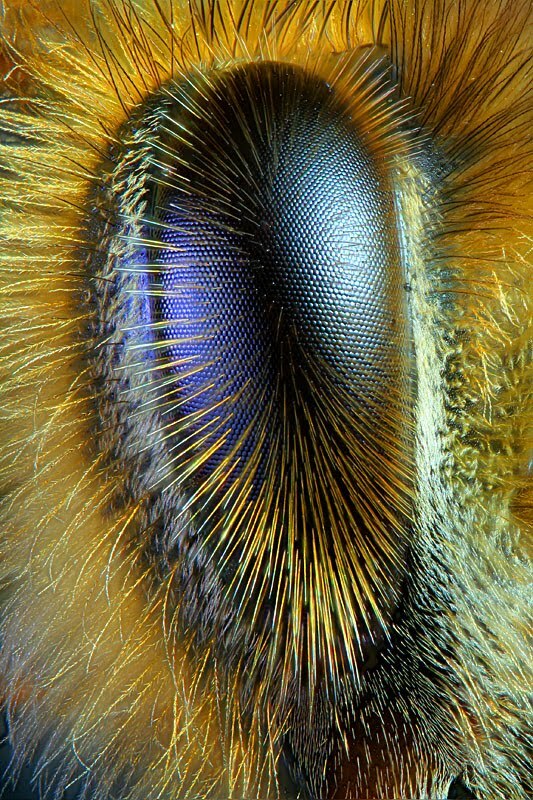 Bees can see ultraviolet light that the human eye cannot see. The ultraviolet light uncovers colours and patterns in flowers that attract the bee to its source of pollen and nectar. The facts of compound eyes and bees is fascinating, but being a designer, you get creative licence to let your mind wander off into all sorts of ideas and thoughts that are triggered by uncovering such rich information & imagery! I started thinking about the (theoretical) possibility of harnessing compound eye DNA and creating lenses that let you “see” things…. all sorts of things (so here is where I start to get a bit privately flouncy)…. Imagine “seeing” the intentions in people, or bodily health, or having night vision or ‘slo-mo’ vision. If body attachments could be created in the future that bond with you to imbue certain enhancements, like cosmetic surgery for abilities (before any scientific minds pull me right up on this, I KNOW it’s not feasible, hence the pre-warning of “artistic license”!). These are some of the thoughts that led to the development of this piece (and other pieces actually, but they are on standby). So the ‘Vision‘ pendant is like an iris, with lashes and a compound pupil. I would like to do this in other colour’s too – green eyes, the much coveted violet eyes, grey eyes, golden eyes, red eyes perhaps. Leave comments on colour’s you might like to see this in! That’s sometimes how it goes. Design development is the time when I am excited and creative about what might come about, when I’m looking forward to getting started and turning it all into actual tangible objects…. It’s why I do what I do….